Jackson Beardy was a member of the Indian Group of Seven. He was born on July 24, 1944 at Garden Hill Reserve on the shores of Island Lake in Manitoba. One of 13 children of John Beardy and Dinah Monias, Jackson lived with his maternal grandparents with the expectation that he would learn and pass on the spiritual traditions of his nation. But Jackson grew up at a time when native children were sent off to residential schools. When he was seven he was taken from his home and spent the remainder of his youth at the Portage LaPrairie Indian School west of Winnipeg. On graduating he studied commercial art at the Winnipeg Vocational School in 1963/64 and later also took art courses at the University of Manitoba. He worked for a time in the display department of Simpson Sears Winnipeg store. But Jackson Beardy had problems. The residential school experience had produced a young man who, on the surface could adequately manouevre in the mainstream culture (but didn't feel part of it) and at the same time was disconnected from his native heritage. He was alcoholic and stomach ulcers often incapacitated him. By 1970 his life's vision allowed him to give up alcohol, but the ulcers plagued him his entire life. The 1960's was the decade when Norval Morrisseau was in his prime and Daphne Odjig had also begun to paint Ojibwa stories and legends. Inspired, Jackson Beardy also drew on the traditional knowledge he'd gained from the close early childhood relationship with his grandmother as well as his personal research and collection of the myths and legends of his Oji-Cree heritage. He had a distinctive graphic style characterized by flat areas of warm colours and curving ribbons of paint. His early work often narrated legends but as his art and his vision matured he explored the natural balances in nature, regeneration and growth, and the interdependence of all things. Some works were rendered on birchbark or beaver skins rather than canvas. In 1970, to commemorate Manitoba's centennial, an event was held at the National Arts Centre in Ottawa. Jackson Beardy's work was featured at the celebration and proudly, he showed up at the gala with his family...but security guards wouldn't let them enter. It's not a perfect world, but attitudes about native people over the decades of my own life have changed. Jackson was a young man who helped bring about that change for us all. Thank you, child. Yet what we have to remember, and what Jackson Beardy illustrated, is that it isn't being knocked down that's important...it's getting up and carrying on. Two years later Beardy was included in the historic exhibition Treaty Numbers 23, 287, 1171 at the Winnipeg Art Gallery in 1972. It was the highlight of his career and opened the gallery doors for each and every one of us who followed in his footsteps. The exhibition was curated by Jacqueline Fry and that show, more than anything, helped shift viewers perception of native art from an anthropological phenomenon to an aesthetic possibility. Within months Norval Morrisseau, Daphne Odjig, Jackson Beardy, Alex Janvier, Eddy Cobiness, Carl Ray, and Joe Sanchez had formed the Professional Indian Native Artists association - now known as the Indian group of Seven. They became the nucleus of the Woodlands School of art. While he was primarily known as an artist, in the latter years Beardy spent a good deal of his time as a teacher...perhaps because in his heart he was a storyteller. He did school visits in Winnipeg and taught classes at the Universities of Manitoba and Brandon. He was an art advisor and cultural consultant to the Manitoba Museum of Man and Nature and to Brandon University's Department of Native Studies. 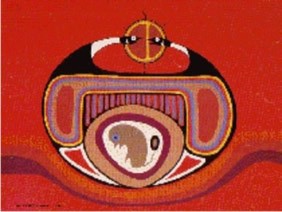 In 1980 he was living in Ottawa, acting as art advisor and cultural consultant to the Department of Indian Affairs and didn't spend much time painting. Four years later he returned to Winnipeg to work on a new series of prints. In November of 1984 he had a heart attack. He rallied but died a few weeks later on December 8, 1984 from infection. A special memorial service was held in the Manitoba legislature building to honor his life and the contribution he made to native art in Canada.